In a small sauce pan, reduce the hot sauce until thick, add the heavy cream, bring to a boil, and lower the heat. On low heat, stir in the butter in stages, keeping the sauce hot the whole time. Set aside, but make sure it stays hot. Heat oil to 350ºF. Whip the eggs and add the milk for an egg wash. Bread the shrimp by rolling them in the flour, then dipping them in the egg wash, and rolling them in flour again. Fry shrimp in the hot oil for 3 minutes (depending on the fryer). Remove shrimp from oil and dry with a napkin. Put shrimp in a large bowl, add the reserved sauce, and toss. 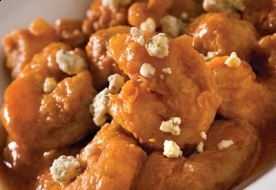 Plate the shrimp, draining most of the sauce from the shrimp as you do so, and top with blue cheese crumbles.